It was horrendously hot, hiking around Iguazu Falls in the height of summer. The sun and thirst were overwhelming, but never mind. The spectacular crash, foam and spray of the Garganta del Diablo (Devil’s Throat), an endless wall of plunging water, made me forget any discomfort. Happily, pleasant relief was in store. Rounding a shady corner, I came upon a pretty buffet of cool sandwiches, fruits and an icy pitcher filled with lime slices and the most refreshing drink imaginable, Brazil’s caipirinha. The appearance of a Brazilian drink in Argentina was understandable. The falls are bordered by both countries, and I could see across to Brazil from the Argentine side, where I was hiking. The caipirinha—I confess, I downed four of them--is like a rum sour, but without the deeper molasses notes of rum. The base is cachaca (pronounced cachasa), a Brazilian liquor distilled from fermented sugar cane juice. Mexico also produces cane alcohol. When I tried the drink at home, I experimented with both Brazil’s Ypioca Crystal Cachaca and Victoria Alcohol de Cana from Hermosillo, Sonora. Aged for a year in oak barrels, Ypioca has a delicate buttery flavor, as if it were trying to become rum. The Mexican spirit is stronger--49.5% alcohol compared to 39% for Ypioca, and it tastes sharp and fiery, like a true aguardiente (firewater). The Iguazu recipe is to crush quartered limes with sugar in a glass, then add cachaca and ice. I tested this with ordinary green limes and also with small yellow Mexican limes. Either works well, but the deeper color of the green limes is especially attractive. The drink is very sweet, but it’s not necessary to cut back on the sugar. Just add more cachaca and ice for a long, cool, summery drink. Place the lime quarters in a large squat glass. Add the sugar and crush into the limes to extract the juice and flavor, using a muddler or the handle of a large wooden spoon. Add the cachaca, then fill with ice cubes. Stir to blend. Allow the ice to melt slightly before drinking. Makes 1 caipirinha. It took half an hour to get a table at Elite Restaurant, the new Chinese place in Monterey Park , and that was for lunch on a weekday. Does this mean the food is great? Not necessarily. Elite replaces the short-lived but well-publicized New Concept, so Chinese food groupies are flocking there to check it out. The word from those who really know food, though, is that the cooking is a bit rough-edged. Some dishes are good, some not what they should be. That certainly was the case with the dim sum my chef friend and I ordered for lunch. We liked several things, criticized a couple more, and left one uneaten. The reject, sweet oatmeal bun, looked nice enough, but the sweet black sesame mixture inside had a weird cheesy flavor, as if it had gone off. We gasped when fried shrimp balls coated with toasty sliced almonds arrived, because they were so spectacular. Large, dense and somewhat dry, they desperately needed a dipping sauce, something sweet and acidic. Then they would have been fine. Baked scallops and turnip cake rated another gasp. These beautiful, golden, shell-shaped pastries were as flaky as could be, although a tad greasy. Inside were strands of daikon (often called turnip) and bits of scallop. The open-faced steamed dumplings shui mai are basic to dim sum restaurants, and a good indication of the skills of the kitchen. Elite’s shui mai are fine, if rather solidly packed. Tiny orange roe sprinkled on top is a newish concept that makes the dumplings look pretty, but isn’t really necessary. In addition to minced pork, mine had a scallop on top and a whole shrimp inside. A nice presentation. My chef friend, who dotes on chicken feet, says that Elite cooks them perfectly, although the sauce was not as flavorful as he would have liked. We both liked home style pancake, a sticky crepe embedded with sliced green onions, bits of Chinese sausage and dried shrimp. Lots of good, savory flavor. Translucent white chiu chow dumplings put up a deceptively plain front. “There’s a whole little stir fry goi ng on in there,” observed my friend, as we bit into the delicious mixture of pork, shrimp, green onions, carrot, daikon, peanuts and cilantro. For dessert, we chose Elite cookies, which turned out to be chewy Cantonese pork cookies—fine, if you’re not worried about cholesterol. Otherwise beware. There are no rolling dim sum carts at Elite, although waitresses appear occasionally, carrying trays of the same things you can order by placing checks on the paper menu supplied to each table. The noise level is high. Waiters replace plates as needed, and there is plenty of hot jasmine tea in attractive bamboo-patterned pots. 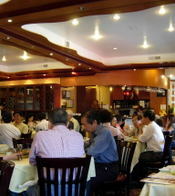 Elite Restaurant, 700 S. Atlantic Blvd., Monterey Park, CA 91754. Tel: (626) 282-9998. Open Monday through Friday 10 a.m. to 3 p.m. and 5 to 10 p.m. Saturday and Sunday 9 a.m. to 3 p.m. and 5 to 10 p.m. I was walking along Pier Avenue in Hermosa Beach when suddenly I found myself in Brit tany. This happened when I stepped into Crème de la Crepe, a small café as French as could be. 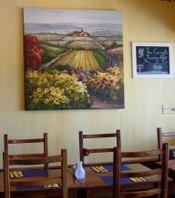 I could almost smell the flowers in the vibrant paintings of the French countryside on the wall. Bright blue and yellow table accents made the restaurant as sunny as if it had been located in one of those scenes. Owner Bruno Baio, who is from Annecy, was there, and my waitress was French too. A sign near the door promised free escargots on Thursday night (too bad that it was Wednesday noon). And a blackboard promoted such dishes as duck liver mousse, quiche and Dover sole with lemon caper sauce. As the name indicates, Crème de la Crepe specializes in that great Breton specialty, the crepe. There are crepes for breakfast lunch or dinner, both savory and sweet. Each has a name. I chose esquise, a thin buckwheat crepe folded around tomatoes and ham enveloped in melted brie. A fresh basil sauce was spooned over the top, and a small green salad was tucked at one side. Aside from crepes, the restaurant offers such French classics as beef bourguignon, steak au poivre vert, salmon en croute and salade nicoise. But when I go back, I will have another crepe--not the Parisienne (chicken breast with cheese and mushrooms in white wine sauce), not the Montagnarde (raclette cheese, prosciutto, potatoes and cornichons) and not the Gauloise (venison sausage in tomato sauce). My heart is set on decadente, a dessert crepe with luscious cinnamon-baked apples and brown sugar, flamed with Calvados. But I could be persuaded to try fondante (pears with melted chocolate and vanilla ice cream); savoreuse (bananas, chocolate and almonds), or splendide (strawberries, honey and vanilla ice cream). As long as it is gooey and sweet, I will be happy. Crème de la Crepe, 424 Pier Ave., Hermosa Beach, CA 90254. Tel: (310) 937-2822. Open daily from 8 a.m. to 10 p.m. The new Japanese restaurant Zu Robata in West Los Angeles plays up the Korean liquor soju in a big way. By big, I mean the huge, dramatically lighted wall that holds 40 jumbo glass jars of soju. This is not mere decoration. 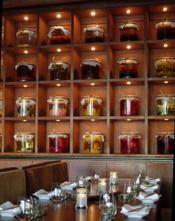 Each jar contains soju undergoing maceration with a flavor component such as fresh fruit, vanilla bean or green tea. When the flavor is extracted, the soju is drained off, transferred to a glass receptacle and placed on the bar, ready to serve. The cocktail list includes such pretty drinks as lemon drop (pineapple-infused soju, fresh lemon juice and simple syrup in a salt-crusted glass), pom tea (pomegranate soju) and a blueberry mojito in which the soju replaces rum. Flavored soju is far from a trendy bar fad. It’s a traditional drink in Korea, often made at home. My Korean friend’s mother infused soju with fruits from her garden, including plums, jujubes, Concord grapes and a native fruit called aengdu, which is similar to a cherry, but small as a cranberry. Drinking straight soju is a guy thing, from what I’ve seen. When I was in Seoul, I stopped by a street stall to eat tempting noodles and vegetable pancakes. The men around me were enthusiastically drinking clear liquid from little tumblers. Water, I thought, but no, it was fiery soju. One customer handed me a slice of kim bap (Korean style sushi) and gallantly offered a taste of his soju. If it had been as deliciously fruit-flavored as the soju cocktails at Zu Robata, I might have accepted. Just before leaving Buenos Aires, I rushed to Louis XV, a pastry shop near my hotel, to buy cookies--not for me, but for my cat. Miss Lily adores palmeritas, the flaky twists that are known as palmiers in European bakeries and orejas in Mexican panaderias. 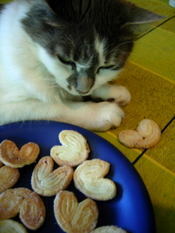 The night I brought her home, she snatched a Mexican sugar cookie from my hand. I knew then that I had to keep her, because she appreciated good food as much as I do. Miss Lily had been dumped in downtown Los Angeles. Sensing that we had something in common, she had shrieked at me from the plants where she was hiding. Her tastes are eclectic—broccoli, asparagus tips, fresh corn kernels and other things yet to be revealed. But her passion is cookies. Crisp cookies. Nothing soft or cake-like. Argentine palmeritas are her favorites, because they’re so small. Those at Louis XV are barely an inch across—just her size. Palmeras are larger, suitable for humans. Especially the chocolate-dipped palmeras at Del Pilar, across the street from Louis XV, where I often eat breakfast. But I couldn’t take those home. There was space for only one small box in my carry-on, and I couldn’t disappoint Miss Lily. She is nice enough to share, though. I get one bite before she grabs the rest, dashing away with her prize while I clean up the crumbs. Palmeritas are 4 pesos for 100 grams ($1.30 for about ¼ pound) at Louis XV Bomboneria and Pasteleria, Avenida Las Heras 2068, Recoleta, Buenos Aires. Tel: 4809-0011. 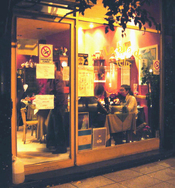 “Sabado Noche, Puchero Criollo,” read the sign on the door of La Olla de Felix, a popular bistro in Recoleta, an upscale district of Buenos Aires. This meant that on Saturday night, owner/chef Felix Rueda would make puchero, which is Argentina’s version of Spain’s cocido, France’s pot au feu and New England’s boiled dinner. Rueda offers this traditional dish four times a year, on national holidays. Saturday night was the closest he could get to May 25, the anniversary of the day in 1810 when the criollos (Creoles) in Buenos Aires unseated the Spanish viceroy and established their own government. Rueda was executive chef of the Ritz-Carlton in Paris for many years before returning to his native Argentina. Therefore, his puchero is no ordinary meal in a pot. The tureen that came to each table contained a beautifully constructed arrangement of meats and vegetables. And it was only part of a multi-course meal. Dinner started with pate and bread, then moved on to marrow bones in broth. Each tureen was heaped with chunks of beef and pancetta, spicy red chorizo, dark morcilla (blood sausage) that was almost too rich to eat and a colorful display of vegetables including cabbage, carrots, corn, and both white and sweet potatoes. Another dish held white beans and garbanzos that had been cooked in the broth. And a condiment tray included tomato-based salsa criolla as well as mustard. After so much food, it was a struggle to eat the slices of pale cheese and quince paste brought out for dessert. The next opportunity to taste Rueda’s puchero will be a Saturday close to July 9, the day Argentina was granted independence from Spain in 1816. If you are in Buenos Aires at that time, visit La Olla de Felix at Juncal 1693 in Recoleta, or call 4811-2873 to make a reservation. No Iron Chef ever faced such a challenge as Dan Perlman set for himself. 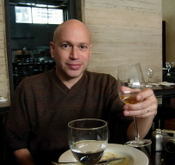 Dan is the chef and wine expert who stages dinners in his home in Buenos Aires. This was my third visit, and a lucky one, because Dan excelled himself as he juggled three themes—the debut of the first commercial mustard, international towel day and the anniversary of the release of the first Star Wars movie. We started with poached leeks accompanied by a Dijon mustard vinaigrette sprinkled with shichimi togarashi, a peppery Japanese seasoning. This took care of the mustard anniversary, which merited a festive wine, a sparkling Codorniu Maria Brut, a Chardonnay-Pinot Noir blend from Mendoza, Argentina. For towel day, I thought we might have towel placemats or napkins, but Dan is more resourceful than that. His first course was straciatella, a clear soup into which he whisked a mixture of eggs, cheese and herbs to give the raggedy look of torn-up towels. The wine was Alfredo Roca Tocai Friulano 2006 from the San Rafael district of Mendoza. Next came strozzapretti alla cervese, ropy, twisted, freshly made pasta resembling wrung-out towels. On top was a mix of eggplant, cherry tomatoes, basil and plump shrimp so amazingly light that I thought they might float out of the dish. The wine for this course was Familia Gascon Rose 2005, a blend of Malbec and Sangiovese from Mendoza. Still more towels appeared as ropa vieja, or old clothes. This was nothing like the beef ropa vieja that is common in Mexican restaurants in the United States, but a sophisticated arrangement of shredded duck on a sweet purple corn pancake with tangy marinated red onion and cabbage on the side. To match such a riot of flavors was a challenge that Dan met handsomely with Callia Alta Shiraz-Bonarda 2006, a deeply colored, full-flavored red wine from the Tulum Valley in San Juan Province. Dessert switched to Star Wars and delicious brown sugar, chocolate chip Wookie cookies. The chocolate dipping sauce on the side was flavored with banana and coconut liqueurs steeped with hot chile. We drank a sweet, late harvest Finca El Retiro Tardio 2006 from Tupungato, Mendoza, with the cookies, and thanked Dan for a fine dinner, although not once did we see a real towel or an invader from outer space.